When Will Marijuana Legalization in Canada Happen? Subject: When Will Marijuana Legalization in Canada Happen? Recreational marijuana legalization in Canada was a key component of Justin Trudeau's 2015 campaign to become prime minster, and it appears he's making good on his promises for marijuana legalization and reform. With billions in potential tax revenue in mind, Trudeau began the effort to legalize recreational marijuana in Canada on Nov. 13, 2015. Trudeau released a ministerial mandate letter (an outline of what the government needs to accomplish) to the public, an unprecedented move, according to Toronto news site thestar.com. In the letter, Trudeau told his ministers they would need to work towards legalizing and regulating marijuana in Canada. Then on April 20, 2016, Health Minister Jane Philpott announced Trudeau's first steps for legalization. At a United Nations General Assembly session in New York, Philpott said that legislation for legalizing marijuana in Canada would be introduced in the spring of 2017. According to the webpage for the Liberal Party of Canada, Trudeau has three focuses for introducing recreational marijuana use to Canada: legalize, regulate, and restrict access. 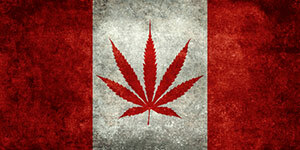 Of the 1,000 Canadians surveyed, 43% of Canadians said they were in support of recreational marijuana legalization. 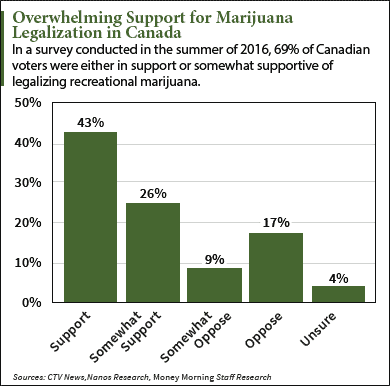 Another 26% were somewhat in favor of recreational marijuana use, which is a total of 69% either in support or somewhat supportive of cannabis legalization in Canada. Only 9% were somewhat opposed, and 17% were opposed. The survey also found 51% of Canadian voters believe the federal government should be in charge of regulating marijuana if it's legalized. That was higher than the 34% of voters who said the provincial government should be in charge of marijuana legalization in Canada and the 16% of voters who were unsure. Although Trudeau is pushing for recreational legalization and Canadian citizens appear supportive, he doesn't want to decriminalize marijuana immediately. Currently, marijuana is only legal in Canada if it's used for medical purposes. But police departments and prosecution services in all Canadian jurisdictions have the authority to pursue criminal charges against those in possession of marijuana without a medical prescription. According to CTV News, Trudeau said he opposed giving a legal stream of income to criminal organizations. Canadian citizens are split on the current laws. According to the survey, 40% believe the police should continue to enforce current laws until they change, while 39% either somewhat disagree or disagree. Money Morning Director of Tech & Venture Capital Research Michael A. Robinson told me on Nov. 15 that there is too much conjecture right now on the timing of when recreational marijuana use would be legalized in Canada. Robinson says the industry has a lot of momentum because of recent legalization in large U.S. states like California.